We’re measuring how companies are using social media technologies to connect with their customers and have data back from the field of over 140 enterprise class corporations, many of which have the coveted social strategist role and formalized programs. To find out how far reaching the social media programs stretch into the enterprise we asked two questions: 1) “Approximately how many employees post content to official social accounts?” and then to derive some ratios for cross-tab analysis 2) “How many employees are in your company?”. We wanted to pose these specific set of questions as it helps us to better understand the proliferation of social business of customer engagement within the hub and spoke model, “Dandelion” and “honeycomb” models. If you’ve not read our report on how companies organize in social media, read the report, and 2011 data. Companies with 2,500 employees have about 13 employees publishing on the official accounts. Companies with 7,500 employees have about 22 employees publishing on the official accounts. Companies with 30k employees have about 83 employees publishing on the official accounts. Companies with 75,000 employees have about 182 employees publishing on the official accounts. 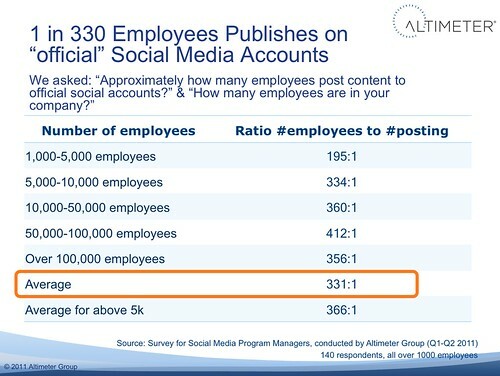 Companies with 100k plus average have about 280 employees publishing on the official accounts. Here’s my take on what this data means, while we’re seeing a broad ratio now, that ratio will decrease over time, as more employees are anointed to use official accounts, and as the internal culture relaxes, giving more access to publish. On average, 1 out of 330 employees uses “official” social media accounts. Overall, few people are publishing on official social media accounts, only 1 out of 330 employees posts to official accounts. One important caveat is the assumption is many are using for their own personal uses, and I would expect the average to be in the ranges of 70-90% as consuming the social content with variations on different production activities. I expect, over time, that more employees over time will use “official” accounts, and connect with customers as processes slowly allow for safe distribution of these roles. Expect that social inbox, and social media management system tools will start to merge with email inbox systems, a push that we already see Salesforce with Chatter and Cisco’s Quad, and IBM’s push into the social enterprise (all are clients btw). Smaller companies have more employees publishing, ratio-wise. We found that smaller companies in the 1-5k range had one out of 200 employees publishing, more likely due to a more flexible culture, less regulatory concerns, and well, less red tape. For medium sized companies, we know that social media is an opportunity as a force multiplier as successful content can be amplified many times over at lower cost, and support costs can be reduced by leveraging the customer crowd base. While smaller companies that have more feet on the social street ratio wise, they are likely still at a 1:1 battle with the larger companies with over 100k employees. Over time, expect all ratios to drop, as prolific next generation rises into senior roles. We’ll be measuring this over periodically, but for now, I would assert that more employees will be using the official accounts over time, as the younger generation learns their way around the business, climbs up the ladder, and is granted ability to publish. With that said, we already know that employee personal accounts can quickly be associated with a corporate brand, even if they have all the disclosure and polices in place. As you might expect, this all ties into our Social Media Management System research, where we’ll be looking closely at how software, service, and solutions, will help companies coordinate and measure their customer engagements in many social channels. Thanks to Andrew Jones, Christine Tran, researcher team for their ongoing contributions, see the rest of the “Social Media Management Systems” posts to learn more about this space.